A Chandler’s Ford based firm of accountants is inviting folk to guess the number of Brussel Sprouts they have on display in their reception and win a Christmas treat! 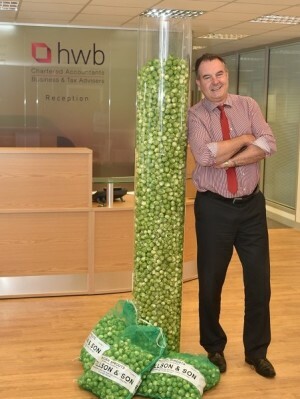 The Managing Director of HWB, Geoff Rhodes, has filled a two meter tube with more than 60kg of sprouts and has Christmas revellers to guess how many of the little green cabbages are lurking in the display. The closest guess will transform into a luxury weekend away in 2016 for two, worth £500*. The tube will be on display in the HWB reception in Mayflower Close and entries can be made online at www.hwb-accountants.com until 15 December when the sprouts will come out and the winner will be announced. “Love them or hate them, the Brussels sprout is a Christmas tradition and whilst we don’t like eating them, counting them, seemed appropriate. The sprouts are being donated to a local nursing home, Chandlers Ford Care Home.